Chinese Grand Prix: Have team orders caused more problems for Ferrari? "Now what?" Charles Leclerc asked his team over the radio during the Chinese Grand Prix. It was a very specific question addressing a very specific situation, but it also neatly sums up the awkward position Ferrari find themselves in after the third race in succession in which they have imposed team orders on their drivers. 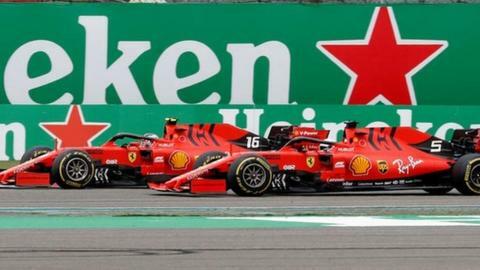 Inevitably, Ferrari's decision to order Leclerc to hand third position to team-mate Sebastian Vettel after just 10 laps in Shanghai overshadowed Lewis Hamilton's dominant victory, a win which sealed three one-twos for Mercedes in the first three races of this season. And equally inevitably, Ferrari - and Vettel in particular - did not enjoy the spotlight on this always contentious subject. Which, if they are not careful, could come to overshadow their season. Which F1 race did you vote the greatest ever? As the early laps unfolded in Shanghai, Hamilton was leading from team-mate Valtteri Bottas, with Leclerc third, just ahead of Vettel. Leclerc was struggling to hold on to Bottas, but he was still just 2.8secs behind at the end of lap eight, about the time Ferrari's team radio was broadcast asking Vettel how much faster he could go. Vettel, it transpires, had been on to the team saying he felt he could go faster. Leclerc was asked to speed up - but the gap to Bottas started growing. Not because Leclerc was going any slower, but because Bottas was going faster. Very shortly afterwards, Leclerc was asked to let Vettel by, which he did, just after crossing the line at the end of lap 10 with the gap to Bottas out to 3.7secs. Now the gap between the leading Ferrari and the second Mercedes was out to 4.8secs - and it kept growing. Not, this time, because Bottas was going faster, but because Vettel was going slower. Now in front of Leclerc, Vettel could not keep up the pace his team-mate had when he was in front - he was lapping in the mid-one minute 39s, while Leclerc had generally been in the high 38s. Leclerc sat behind, just a little bit further back than Vettel had been behind him. Vettel was pushing, and at times it looked like he might be stretching the gap. But he was also making mistakes, locking brakes, and any ground he made up he was losing again. The gap to Bottas went up by 1.4secs over the first two laps Vettel was running third - which was when Leclerc came on the radio and asked his question - and by 4.8secs over five. Meanwhile, Max Verstappen's Red Bull was tracking the Ferraris, just two seconds behind, and on lap 17 his team pounced. He pitted for fresh tyres, going for the 'undercut' - where a faster out lap jumps a driver ahead of a driver still out on slower, older tyres. Leclerc's fourth place was gone - and Vettel nearly lost third, despite stopping on the next lap. For the rest of the race, Ferrari were on the back foot against Verstappen. They strategised reactively, rather than proactively, and were made to look flat-footed. They managed to protect Vettel's third place, but Leclerc was sacrificed as being left out on old tyres - twice - leaving him in a helpless fifth. It must have been all the more galling for Leclerc that the second time he was left out was to be used as a blocker against Bottas, in a vain attempt to help Vettel close on the Mercedes. What were Ferrari trying to do? Ferrari's approach to the race was not a surprise. Team boss Mattia Binotto has made it clear that Vettel will be given priority in "50-50 situations" because they believe "he is the driver who has got the most probability to challenge for the title". You can see their argument. Vettel is a four-time champion and Leclerc is in his second season. As such, they feel Vettel is the more likely to put together the stronger season, and therefore be their best chance of beating a Mercedes driver to the title. In China, Ferrari were watching the Mercedes pull away, and their team leader was telling them he thought he could go quicker, and they thought it made sense to give him a chance to try to chase down the silver cars. It was their only possibility of winning the race. "We simply tried to give Sebastian a go and see if we could have kept the pace of the Mercedes, which was key at that stage of the race," Binotto said. "It was not to give an advantage to a driver, to the other driver; merely as a team to try whatever we could. The early stage was an important moment of the race." It was an understandable decision at the time, given the information they had. But it unravelled quickly once it became clear Vettel could not go faster. "It was not an easy situation," Leclerc said. "I was struggling with tyres - we both were - and it just felt like Seb was quicker. But obviously being behind me for some laps he also damaged his tyres." Binotto said: "It is difficult as a team to give the order because we understand the drivers and they need to stay ahead as much as they can. It was not an easy decision. "I have to thank Charles for the way he behaves. He is again showing he is a good team player but there will be a time when the situation is maybe inverted. I think as a team we need to maximise the team points and in that respect I think we did the right choice." Except they did not maximise the team points - they gave some away to Red Bull. Not only in losing Leclerc the place to Verstappen, but also in failing to give him a chance to go for the point for fastest lap at the end of the race. Vettel held it for a long time - but Red Bull pitted Pierre Gasly for fresh tyres and he just sneaked it. Ferrari could have pitted Leclerc, too, without him losing a position, and he surely would have gone faster than Gasly, who had been struggling all weekend. But they didn't. Ferrari's policy has been in place since before the start of the season. It's how they have decided is the best way to try to beat Hamilton and Mercedes to the championship after two humiliating losses in 2017 and 2018. And they are applying it with some gusto - this is now the third time in three races team orders have been imposed. In Australia, Leclerc was asked to hold position behind Vettel in the closing stages having caught him at least partly because of a better tyre strategy. He obeyed. In Bahrain, Leclerc was asked to stay behind Vettel for two laps after catching him following a poor start from pole position. He ignored the team, overtook anyway and was on his way to a dominant maiden victory when his engine hit trouble and he dropped to third - still finishing ahead of Vettel, who had spun battling with Hamilton. After the race in China, Vettel was asked during Ferrari's post-race news conference whether he agreed this was the best way to fight the championship. "I don't know," he said. "Ask Lewis. Mercedes has been in a different situation but it is not the first time we have seen something like that. We try to do everything as a team. "Two weeks ago, Charles was faster and it was quite straightforward and also maybe a bit easier to pass in Bahrain. "But the upsetting thing after the race is we didn't manage to finish third and fourth. I want to be ahead of Charles, he wants to be ahead of me. That is the name of the game. I don't want to expand further especially (given) what you make out of the answer." Earlier, in the official F1 news conference, he had said this, when asked if the team order was fair: "It's fair if you see the whole race. I knew the moment it was happening that I would have to face these questions. Not sure I want to answer because I'm a little bit against the way you - all of you - work, because you take bits out of answers here and there and put it into the wrong light. "So, if you ask me again in half an hour down in the paddock, maybe I give you a straightforward answer and you don't write it down or record. Seems the way that, not maybe all of you but some of you are working." Vettel's sensitivity is understandable, because the wider context here - are Ferrari right to back Vettel so early in the season? - questions his position in the team. The problem for Ferrari is that they are treating Leclerc like a number two, but he is very clearly much more than that. Many suspected he would prove a stiff challenge for Vettel this year, and so it is proving. As things stand, Hamilton is already 31 points ahead of Vettel, after just three races - in one of which Vettel made the sort of error, during an on-track battle, that cost him his championship challenge last year. Leclerc is one point behind his team-mate. Had Ferrari simply let their drivers race, the picture would potentially look a little different. From the pace at which he caught him on fresher tyres in Melbourne, it seems likely Leclerc would have passed Vettel for fourth place. Had they let them race in China, and prioritised the lead driver at pit stops as is normal practice in F1, Leclerc would have finished third, not Vettel. That would give Leclerc seven more points than he has now - and put him 25 points behind Hamilton, as well as ahead of Verstappen into third place overall. So, ironically, Ferrari would potentially be in a better position in the championship had they not pursued a policy aimed at maximising their position in the championship. Those points are gone forever now. But if that is not causing some serious pause for thought at Ferrari, one could be forgiven for thinking it probably should be.